Most of us seek cinema to retreat from the real world and the troubles found within our daily lives. It is no surprise that the lavish opulence of Titanic and the rambunctious space adventures found in Star Wars attract such huge audiences - their sole purpose is to provide fantastical distraction from the misery found in every corner of the globe, in shadows we purposefully choose to avoid. Factory Boss, a Chinese film directed by Zhang Wei, is very much the antithesis of the blockbusters noted in this article's opening paragraph. Here we see a movie which doesn't placate us but, instead, challenges us. This isn't escapist entertainment but, rather, represents the opposite of much of Hollywood's standard fare - Wei's film is bold, upsetting and, ultimately, important. Set in the fall-out of the world economic collapse, Factory Boss takes us to a time when China's multiple toy factories are threatened with closure - only a few survive and the conditions in the ones which do are not up to the standards we'd seek in the West. Worker's rights are non-existent, at best a set of insincere platitudinous expressions offered as assurances to willingly naive American business partners, and safety is considered secondary to cost-saving. A significant order for cheaply assembled toys gives the titular boss an opportunity to keep his factory running - but at what cost? Faulty ventilation is ignored; money can be saved by persevering without it. Workers are abused; perhaps this is necessary for the good of the many? This, we can see across an episodic tale, is clearly a Faustian pact unlikely to feature a happy ending. Making its European premiere at Regent Street Cinema on February 26, Factory Boss may well constitute not just the most outstanding presentation at the Asia House Film Festival but one of the truly great, under-seen movies of world cinema in recent years. 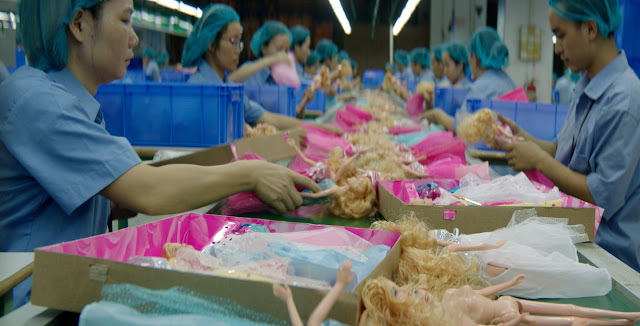 Continuing the festival's theme of globalisation, Factory Girl challenges us to consider the destructive nature of capitalism and our own place in the dehumanising exploitation of others we rarely consider. Having witnessed the movie, and considered the cheap fee we pay for goods assembled in China, the movie asks us to consider our complicity in the terror we witness; over 104 minutes, the audience shifts from ignorantly amoral to potentially immoral. Have you or I, for example, considered where the parts for the lap-top or phone we're reading this come from? Fascinatingly, too, Factory Girl provides a perspective on the differences between Chinese and American capitalism. China, for the most part, does not innovate but rather looks for gaps in the market, for existing opportunities, and provides required goods and services for low costs. American capitalism, conversely, is inspired by protestant notions of individualism; sole entrepreneurs dream of inventions, creations and ideas which they then try to retro-actively seek a market-place for. We see the Chinese version of capitalism - the collectivist struggle for achievement (rooted partially in Confucian ideals) - find a rare representation on the big-screen and, as such, Factory Boss gives us a rare opportunity to consider our place, and the place of others, in a deeply interconnected and painfully unequal world. This screening features a Q&A with director Zhang Wei.